“How can I improve my financial lot in life?” It’s a question that has been posed for centuries and in the current millennium, there is a new approach: investing in cryptocurrencies. Predicting and managing a portfolio of digital coins and tokens is a tricky business. It is much like investing in individual stocks. It is very risky. You need to know the common mistakes. I don’t recommend day trading. Find an asset with good potential future value. Buy it and hold it. If you trade too much, you will end up giving all your profits to the exchanges. Also, diversify your holdings. Pablo Alexandro Lema’s book, Crypto Success: Investing for the Long Term, is a short interesting introduction. Last June, when many new cryptocurrencies were being created, I contacted Pablo to get his advice on the new tokens and coins (there were hundreds of new coins being introduced). He said that most of the coins were scams and that he was not investing in many. Looking back, he missed out on a time of fantastic growth. But it is generally better to be safe than sorry. Many coins are scams and you have to be careful. There are “pump and dump” scams where coins are listed on an exchange, demand is artificially inflated by the coin backers when the coin volumes are low. When the market notices and buys the coins, seeing the sharp increase, the backers sell and then the price drops. The new, outsider investors are left with a loss and the coins value stays stagnant. There are many scam artists in the cryptocurrency world and you should be careful. There is much value in cryptocurrencies and many that are worth considering. The biggest, of course, is bitcoin (BTC), which is trading today at around $9,500 and has a market value over $160B USD. The second most valuable coin is Ethereum (ETH) which is trading at $790 and has a market value of $78B USD. There is a lot to learn about these coins. You can go to websites that promote them. Read articles. Visit the online communities to confirm your assessments. Reddit.com has some very sophisticated users who will answer questions. You can look at prior posts and learn. Coinmarketcap.com is a good place to explore coins and see where they are trading, find their websites, and look at their history. You can see how much development activity the coin developers are doing by the number of uploads at Github.com. One of the biggest challenges is learning to deal with exchanges, wallets, and the risks of both. It is not for the faint of heart. In the US, Coinbase.com is the more popular, as they offer insurance for coins deposited there. Read about the benefits of each cryptocurrencies and understand the value. How much is it worth? The value of Bitcoin is a big question. Many say it is overvalued. But they are viewing it as only a currency. When treated as a store of value, like gold, Bitcoin’s value could increase from the $230B today to ten times that value. But what if one of the other 1000 coins proves to be a better store of value? Then Bitcoin could drop hard in value and another could eclipse its top dog of currencies status. The one thing most coins have in common is the blockchain, the open, encrypted ledger for these coins. The benefits of blockchain technology is the ability to trust a community of users, usually without a centralized authority in an autonomous system. THE BLOCKCHAIN is creating value by enabling trusted communities that can serve without a centralized authority. That is why criminals and libertarians are so interested in these coins: there is no longer a need for a central government to run the currency. A big reason why investors are interested: because most coins, like Bitcoin, are set up to have a limited supply of coins, so their value cannot be diluted with new coins in the money supply. The blockchain (and coin mining systems) remove the need for a central banker. If you are able to find a valuable cryptocurrency, try to understand what the market is worth and then the value of that coin. What market is the coin servicing and, realistically, how big could that coin’s role become in that market? Then confirm whether that coin’s supply of coins is limited and divide the total potential markets share by the supply (the maximum number of coins in circulation). That becomes the best case value of the price of the coin. Are there other coins in the same markets? Will they coexist and therefore each will have a smaller share? Then what are the chances the coin will fulfill its promise? Look at the community behind the coins. Look at the people leading the coin technology. What is amazing is the way that blockchain technology is being adopted in so many areas. We are seeing a phase of blockchain adoption that shows the huge value of the technology. 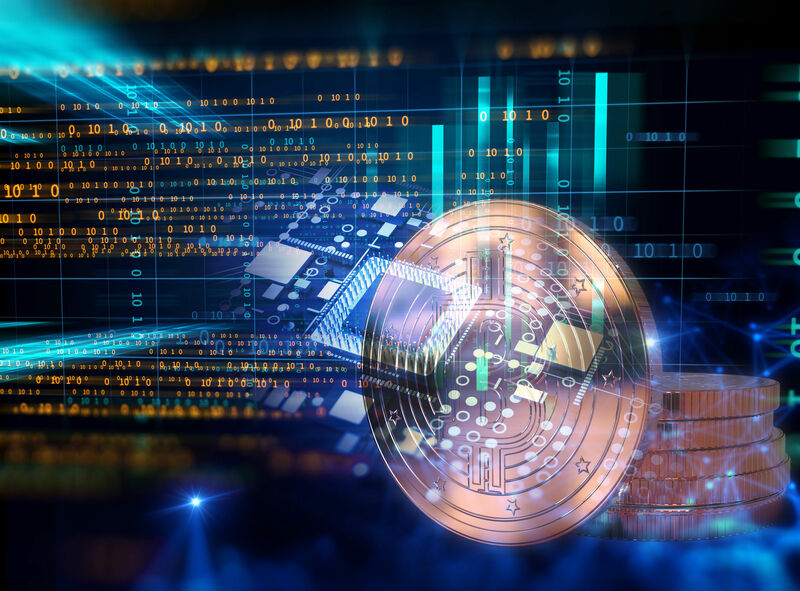 At the same time, this new autonomous technology is offering a secure way to fund the new technologies based upon blockchain in the form of initial coin offerings (ICO). The value it is creating is hard to measure, though coin prices are showing there is great value to be had. But you need to have a realistic value based upon the coin’s features and the markets in which it is serving before you can tell if the value makes sense. Many coins today look overvalued. Some do not. The answers are hard to find, but if you look hard on the Internet, and find sources you can trust, you can find guides to success in cryptocurrency investing.